Beautiful 5 BEDROOM HOME w/ brick & stone elevation on a CUL DE SAC street. Great floor plan has 2 STORY CEILING in family room. Hand scraped engineered WOOD FLOORS; WROUGHT IRON SPINDLES & TILE in wet areas. MASTER DOWN, LARGE GAME ROOM & 4 BEDROOMS UP! Kitchen has stainless appliances, granite & TRAVERTINE TILE. Formal living & dining. Spacious bedrooms. 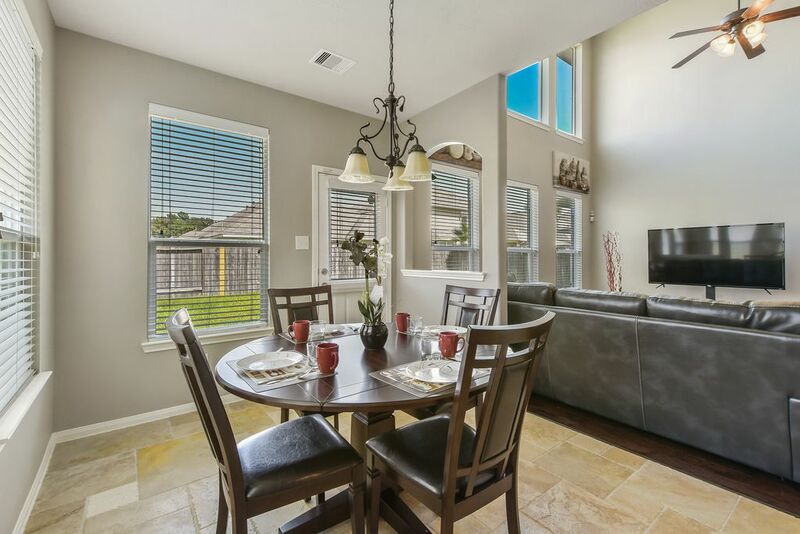 Easy access to I-45, Grand Pkwy, Hardy Toll Rd, shopping & dining. We were in town to celebrate a "milestone" birthday for my brother-in-law last weekend. The house was perfect. Clean, neat and lots of room. A total of four couples stayed there. Didn't have to worry about drinking-and-driving. The kitchen was great, and there were plenty of bathrooms. It is also near local shops and grocery stores. Best of all, it was right around the corner from their home! We had a great time and will rent again! Thanks! We stayed here during the spring break. Very clean and spacious house. Dolly and James kept this place really tidy and communication with them was a prompt and very timely fashion. Definitely, recommend this place. This property was beautiful and spacious. A perfect home for a large group. This home was very clean and so accommodating for a large group. The 5 bedrooms are spacious and well laid out. There was plenty of community space as well. The kitchen is beautiful and easy to cook in, and there were several TV's so everyone could have choices. The property is also convenient to shopping. I would highly recommend this home and would come back in a minute should another occasion arise for us to be in the Spring area. Very well kept. Hope to go back next year. Loved this place. Property was easy to get in and out of. Lots of places to eat around there! The owners were awesome & always available to talk to if we had questions or problems. This was a great place with plenty of rooms. So much nicer when everyone has their own room. Nice and clean with a great location. Plenty of lounging space and lots of little extras that were a nice touch. We are leaning towards coming back here again next year.